This weekend, I had the pleasure of going to my Aunt Susan Eaddy’s book launch at Parnassus in Nashville, Tennessee. Being a newbie writer, I haven’t done a book signing or reading, and I was interested in the mechanics of the event. My Aunt Susan has been an illustrator and artist for her whole life. 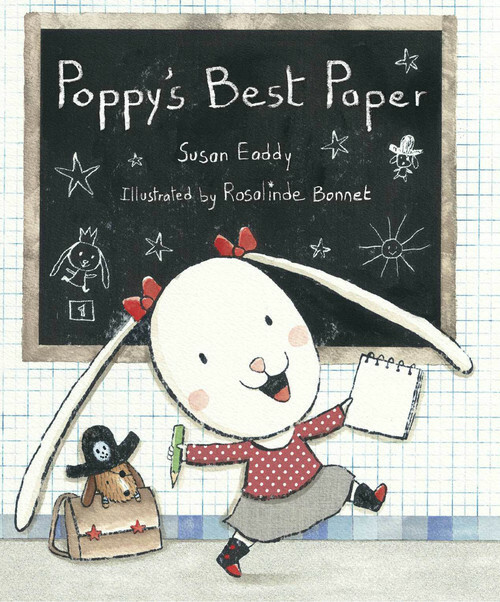 And she wrote Poppy’s Best Paper and another illustrator, Rosalinde Bennett illustrated the work. This book is great for 5-8 year old children. My 5 year old daughter loves it. It’s also great for writers, because Poppy is a procrastinator. How many of you all can relate to that? During the book signing, Aunt Susan had a cake with the cover of the book printed on the front. She used a slide show, and she read the book to the crowd. And she told a personal story about herself as a fifth grader (about Poppy’s age in the book). Afterwards, she had some great questions, especially from the younger kids in the crowd. I told her she looked so comfortable in front of everyone, and she said, “Well that’s a relief, because I was so nervous.” I’m super scared about the public speaking aspect of writing, and it was great to see someone like my Aunt who I look up to so much and who is so inspirational to me stand up there and speak with ease about her dream and how she achieved it. Dreams are so important in life. What are your dreams and how do you think you’ll go about achieving them? Don’t forget: No Turning Back is on sale for $1.99 from now until August 21st! Pick up your copy at or now. ← No Turning Back from Kindergarten! My biggest dream is to have a novel published and being able to hold a copy of it in my hands. So far, I haven’t done anything to achieve that dream. George–keep working and you’ll get there. I know you will! Me too! I thought it was so darn cute. And of course the kiddos liked it too! My journey from here to there. Where an English Teacher Englishes. A not very secret diary by Phill Slater.